Want to get more traffic from the video marketing? Are you Ready to create the animated videos to catch the eyes of the audiences? Do you know the killer animated video software—Animiz? Animiz is the professional animated video software that enables users to create animated training videos, animated explainer videos, product advertising videos and more. Animiz animated video software includes two parts—the desktop editing software and online publishing platform. There are three interfaces on the desktop editing software: starting interface, editing interface and publishing interface. As for the online publishing platform, it is free for all of you to publish the video online. No coding, no designing experience needed. Everyone can create animated videos in minutes. And there are two animated video creation tutorials for beginners and professionals to refer to on the website. It has 300+ built-in templates, 500+ animated roles, 1000+ royalty-free vector images, and 200+ dynamic animation effects. Everything needed is prepared for your unique creation. It has a simple multi-track timeline to customize background, camera, captions and animations. You can drag and drop to extend /shorten the display time. The entrance and exit effect of the content is on your control. Hundreds of cooling animation effects to easily bring your animated videos to life. All of the animation effect can help to make the video engaging and lead the audience to think as you are. Make your animated videos more impressive with explanative captions and voiceover. The voice makes the video more convincing than the silent video. How to activate Animiz account as the 6-month standard user with “Activation Code”? Please use the activate code: YTRI-M2JH-YWY0-MMRH-MTM0 to upgrade your account as standard user before October 20. 3 – Activate your account with the activation code. 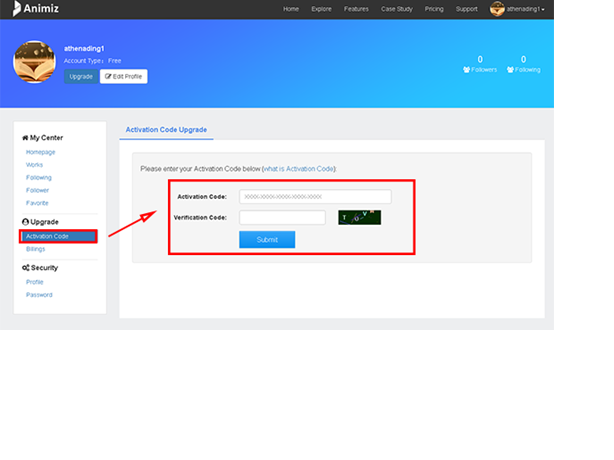 Click “Activation Code” button, then enter Activation Code and Verification Code inside the box, ‘Submit” to activate your Animiz account. 4 – Get the success notification. When you succeed, you can get the notification. The expiration time depends on the day you activate the code. After above steps are done, you can download Animiz desktop version to start making your stylish videos and gifs. Windows 10 introduced a feature called ‘Fast Startup’ which allows the computer to start faster and Windows recommends to have it enabled however there are problems occurring due to the ‘Fast Startup’ feature. Among the problems Windows 10 ‘Fast Startup’ brings is the incorrect loading of device drivers. Windows 10 ‘Fast Startup’ does NOT load drivers properly and that is a fact. So, if you are using Windows 10 and your network keeps dropping or your printer does not work or your video cameras and virtual video cameras don’t work with applications like Skype for example then you should disable Windows 10 ‘Fast Startup’ and everything will go back to working properly again. I believe Microsoft’s idea is valid but the technology is not ready yet so I recommend to turn it off on your Windows 10. Note also that important Windows 10 updates re-enable ‘Fast Startup’, so make sure to check your ‘Fast Startup’ settings after a Windows 10 update. You can use the following steps to enable or disable fast startup. 4. Click Choose what the power buttons do. 5. Click Change settings that are currently unavailable. 6. Scroll down to Shutdown settings and uncheck Turn on fast startup. Click Save changes. Thanks for reading up. Until the next article.